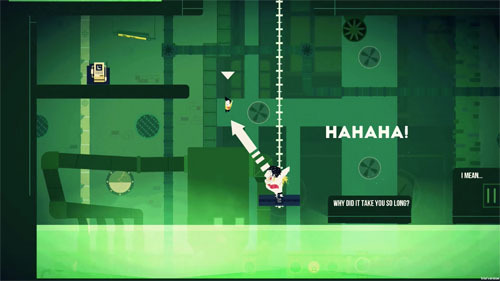 Klaus has a very high variable jump and double jump, requiring very precise movements on the part of the player to navigate the environment. 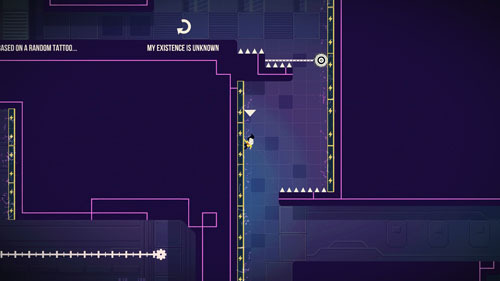 For a game that is primarily a platformer, the jumping mechanics are a bit inconsistent. First off, you have a very slow walking speed, and jumping from a walk gives you a lot of vertical distance but not much horizontal distance, so it’s best used when jumping up along a vertical shaft. On the other hand, your running speed is considerably faster, and jumping from a run gives you tremendous horizontal distance, so this is primarily used to cross gaps. Because of the vast differences in jump trajectories and the fact that there’s no inertial buildup between a slow trot and a full sprint, it’s tough to find a middle ground, which may find you missing platform landings that you would otherwise nail in any other platformer. Things get even more squirrelly depending on certain environmental conditions. For instance, jumping from a conveyor belt is further complicated by the lack of inertia, so jumping against its movement sometimes results in an impotent hop verses a huge leap. Midair movement is similarly inconsistent. You have a lot of midair direction control when performing a jump, but if you bounce off a springboard, you’re stuck moving at a specific angle until you reach the apex of your jump and then you have only a brief moment to adjust your trajectory, and the midair direction controls are much more sensitive during a springboard jump than a regular jump. Later levels have you grabbing onto bouncy walls and springing away at high speed, but your initial jump is slow and – defying physics – your speed increases while you're in the air. And if you’re standing against a wall when you jump, you are sometimes bounced backwards, which can cause you to whiff a jump entirely. The game compensates for these somewhat unwieldy controls by providing frequent checkpoints and very little penalty for death, aside from a short reload time and a small amount of repeated gameplay. 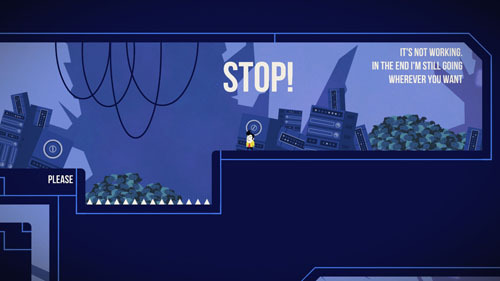 Given enough attempts, the player can eventually overcome these inconsistencies to make it to the next checkpoint and make steady progress forward. Unfortunately, much of the game’s difficulty is derived from unreliable controls rather than clear environmental challenges. 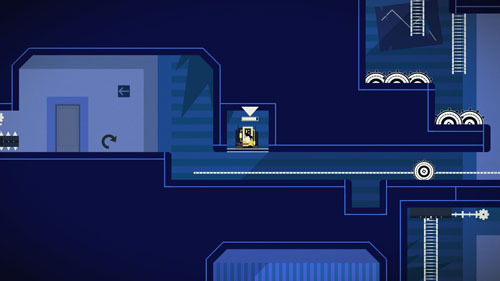 The player controls Klaus and also works in tandem to manipulate platforms, doors, and rotate objects… and this control is a bit sticky when using a controller to swap between them, as compared to a mouse or touch pad which each provide a smooth-scrolling cursor. 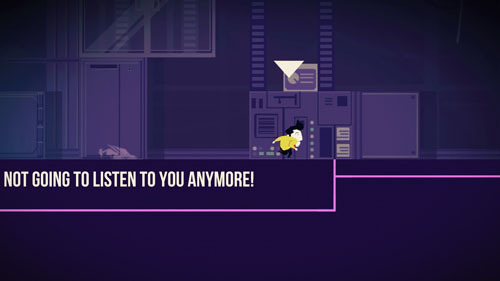 Usually these controls are used to help Klaus get further into the level, but sometimes the player must use these interactibles to inhibit enemy movement or block lasers. Klaus has no offensive capabilities and is killed in a single hit, so the player must constantly work to protect him from harm. Klaus’ one ability is hacking, which he uses to trigger platforms that cannot be interacted with by the player. In almost every level, usually a bit off the beaten path, there is a flashing circle, and touching it teleports Klaus to a dedicated challenge area. Each of these challenge areas offers a short platforming sequence, and many of them toy with the core mechanics in fun ways, often subverting expectations established in the main game. 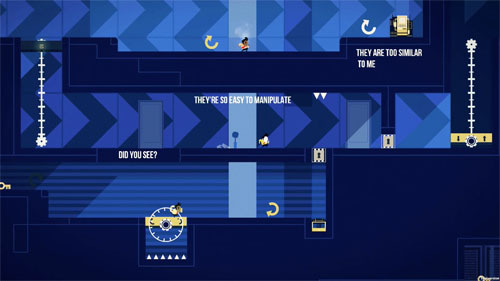 For instance, in the first area, the player only has the ability to move to the left; in other areas, the player may find that he is incredibly large or incredibly small in comparison to the objects around him; in some, the player controls multiple copies of Klaus simultaneously and must be mindful to keep all of them safe while completing platforming challenges. 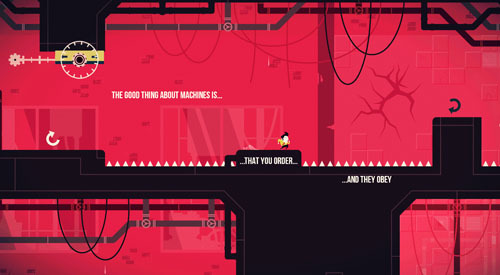 Many challenge areas offer surreal elements, such as using words as platforms, or climbing over a pile of Klaus-silhouettes to reach the end of the level. 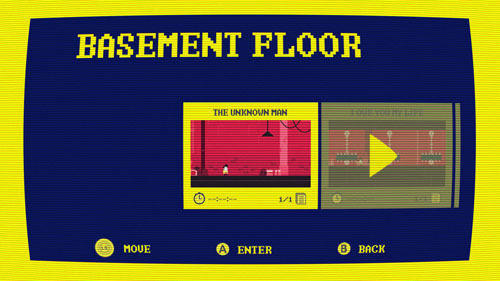 At the end of each challenge area is an object to be collected, which represents a piece of a door. 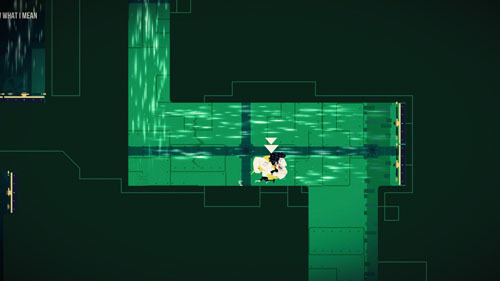 Once the player has collected all six door pieces, he is transported to an entirely new area that offers exposition on some of Klaus’ backstory. 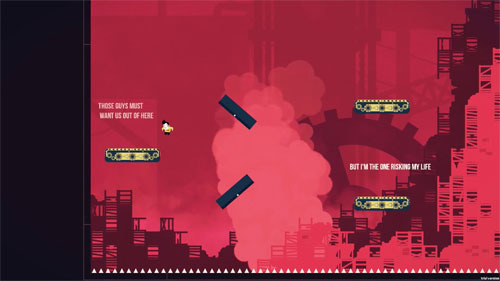 These areas feature some basic platforming but no enemies or hazards, and stories play out as images in the background - some of which the player can jump onto - along with text overlaid in the foreground. There are six such story sequences, and finding them all requires the player to locate and complete a total of 36 challenge areas. Challenge areas aren’t terribly difficult to locate, as there are always environmental clues that hint at their locations, but it’s still possible to miss some of them on a first playthrough. 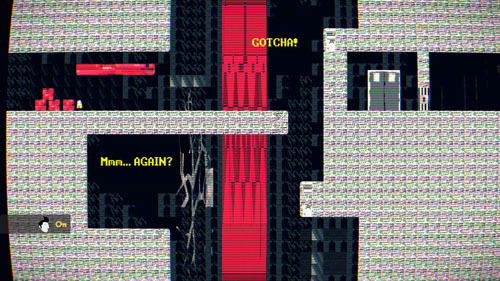 Once the player reaches the end of the game, he unlocks an arcade mode that allows him to replay any of the previous levels for speedrunning purposes or to collect missing door pieces. Collecting them all is the only way to reach the game’s final boss and true ending. 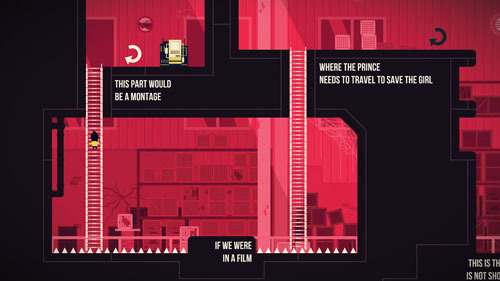 The game is divided into six areas, each taking place in a different part of the building, and each represented by a different background color scheme. There are only three bosses to be found across the game’s 34 levels, and these encounters essentially boil down to memorization. Each boss attacks in the same basic manner, repeating patterns and adding new moves into the mix each time you strike it, with three hits killing it, per gaming standards. Some attacks are virtually unavoidable the first time you encounter them, so once you’ve seen everything the boss can do, winning the fight is simply a matter of memorizing and repeating a set of actions until the fight is won. The first boss battle occurs at the end of the first world, and it’s against a fellow called K1. K1 is a brute and appears to be some kind of overgrown, mutated version of Klaus himself. He is wearing the same clothes, although they are torn and shredded due to K1’s enormous size. 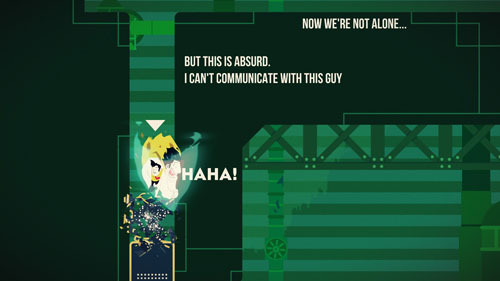 Once this battle is over, Klaus befriends K1 – who is kind, but dumb – and the player is then able to control both characters. 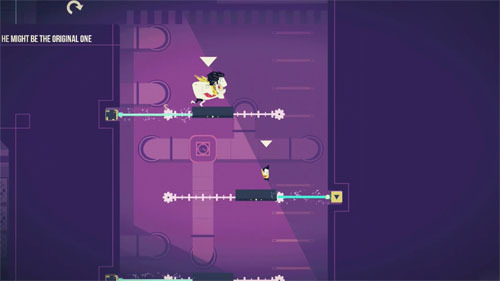 Throughout most of the game, the player can alternate between the two characters, or control them both simultaneously. K1 can do a number of things that Klaus cannot. First off, he is able to punch, which lets him smash enemies and break through destructible barriers to open the path forward, and he can also smash objects below him or perform a downward strike to hit enemies or break through a stack of destructible blocks. Secondly, he wears his shirt as a cape and is able to use it to glide over very long distances with his incredibly slow descent speed, and this lets him reach areas that Klaus cannot. Thirdly, since he does not have a double jump, K1 can perform an uppercut. When combined with his gliding ability, this means that K1 can take to the skies, glide under overhangs, and then perform an uppercut on the far side to add a lot more distance. Finally, K1 can pick up Klaus and hurl him into the air to reach high platforms. On many occasions, Klaus and K1 find themselves separated. Klaus may reach a small opening that K1 is too big to pass through, or K1 may encounter a gap that is too large for Klaus to cross. In these instances, the player takes over one character who moves ahead on his own. In most cases, that character breaks a block or hacks a computer (or destroys a computer in K1’s case) that opens the path for the other character. Often, the player swaps between characters several times during the course of the level, and in some cases, the duo actually leave the level separately to complete levels dedicated to their individual skillsets. Virtually every permutation of obstacles appears throughout the game, offering quite a lot of variety between levels as players learn new techniques, master those techniques, perform actions that subvert these learnings, and then go onto a new level where new techniques must be learned. Levels are designed in such a way that it’s almost always clear what actions need to be performed to move forward, and challenges are not overly difficult. 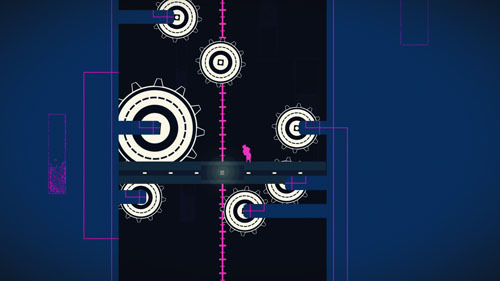 Frequent checkpoints mean that almost any level can be completed simply by repeating the challenges until the player gets them right. Many areas break up the pace by changing how the player engages the environment. 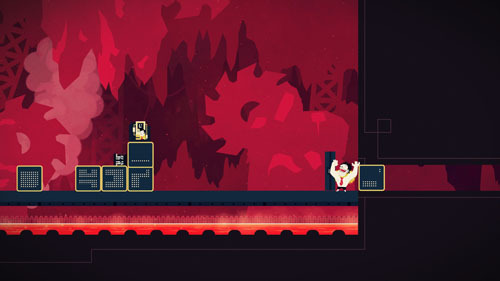 For instance, a few levels place Klaus and/or K1 in an auto-scrolling level where they must hurry forward to avoid being scrolled off the screen and killed. Some areas have crumbling blocks that rebuild themselves after a few seconds, forcing you to hurry across and avoid being crushed as they are rebuilt. 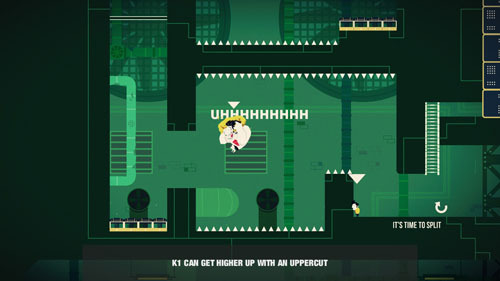 There are many challenges where the duo needs a key that cannot be reached with either of their skillsets, so the player must manipulate platforms to push the key through the room – without destroying it – until Klaus or K1 can grab it. The fifth world in particular offers lots of new gameplay types and subverts just about every expectation established up until that point. Intermixed with these challenges are gaming staples like conveyor belts, springboards, and ladders, with the added factor that the player can sometimes control them or use intractable platforms to move them around. 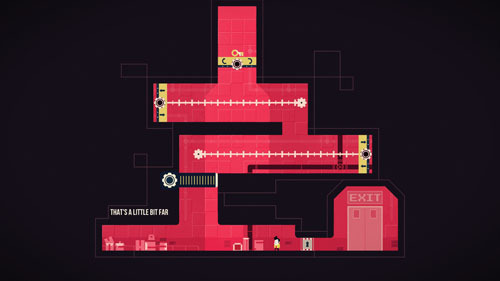 Some levels feature the player running against the wind (or blocking it), performing wall jumps, or dodging coffee-swilling office drones. And of course, the player must avoid spikes, spinning saw blades, and lasers. Later in the game, Klaus actually rebels against the player. In the early going, he is appreciative of your assistance, but he eventually comes to realize that his actions are being controlled as well, so he commits to moving in the opposite direction that you’re pressing. 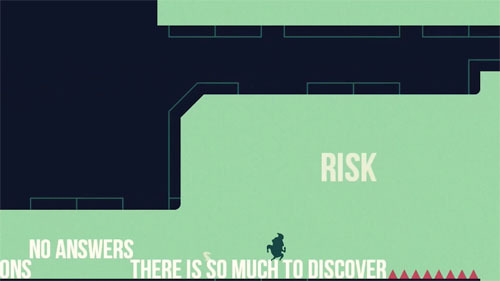 In a few levels, he moves on his own, forcing you to clear obstacles in his path while he marches forward into danger Lemmings-style. Eventually, Klaus starts to encounter things that make him question the nature of his being, and that of K1, which drives him forward to solve the mystery. Klaus, a.k.a. -KLAUS-, was developed by La Cosa Entertainment, based in Los Angeles, California. 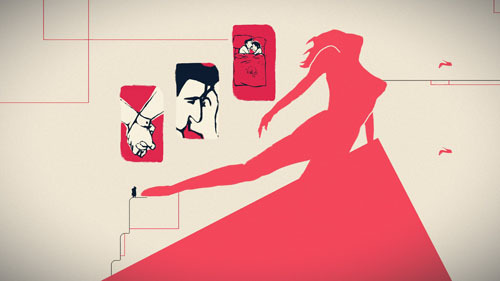 The studio was founded in Caracas, Venezuela by Victor Velasco and and Ginaris Sarra in 2012. The game was initially developed as a submission to the Square Enix Latin America Game Contest.